Public realm and architectural lighting design, ongoing. Green Lanes is one of the longest roads in London. 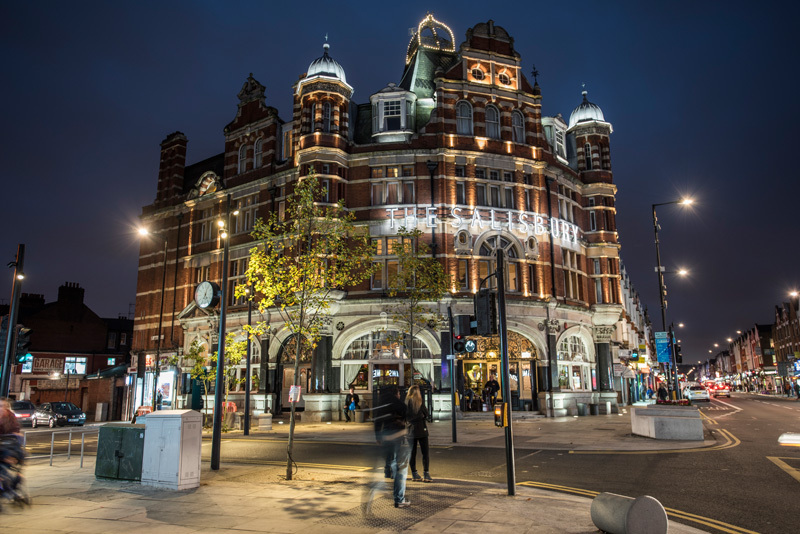 Between Green Lanes Overground Station to St Ann’s Road in Harringey runs a vibrant and cosmopolitan high street of restaurants, cafes and independent retailers set within the distinctive built environment typified by Grand Parade and the Harringey Ladder. The Green Lanes public realm improvement programme aims to enhance the pedestrian experience along the high street, with shop front and ground surface improvements based around “mini-squares” at key road junctions. Studio Dekka designed bespoke column mounted spotlights and tree-mounted “can” lights for a series of high quality aprons between the high street and the perpendicular residential streets. The sequence is book-ended by architectural feature lighting to Green Lanes station railway bridge and to the famous the Grade I listed Salisbury Hotel. Funded by the GLA and TfL.